We were hungry, mind you. 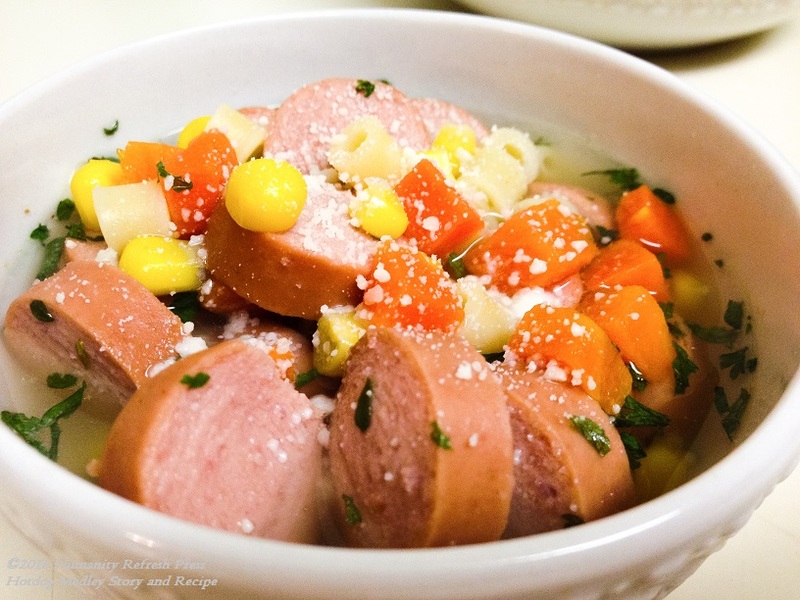 I would have never thought of making a hotdog soup, but it is exactly that kind of thinking that got us through. My husband took a job driving an 18 wheeler across the northeast in February 2004. We had three of four children at the time.The kids and I hugged him on the afternoon that he left our apartment. Then we all stood at the screen door watching him walk away. We all hugged each other again the moment he was out of view. We cried a bit loud while hugging. We “heard” ourselves. Then we all started laughing because we’re just weird. He managed to come home some weekends, and we missed him terribly. That job was supposed to get us out of low-income status. Instead, we received his paychecks totaling between $0 and $25 every other week back home. Our car was a broken down mess, we struggled to get laundry done. We couldn’t make it to appointments. Friends and family alike sounded like they were getting sick of us asking for help. We were sick of asking for it too! One day while he was away, I made a dinner out of all we had left as the kids sat at the table anxiously awaiting “Mom’s experiment”. I gave it a colorful title to make it seem special, and we ate it. To our surprise, it tasted a lot like Won Tong soup. We had seconds and thirds. We were hungry, mind you. I would have never thought of making a hotdog soup, but it is exactly that kind of thinking that got us through. Before then, I was doing a great job in my vegan lifestyle, but food choices became limited to food pantries, which seriously lacked fresh vegetables and instead had an abundance of processed foods, including meats. What parent is going to scarf down the freshies and not entice the kids to eat them instead? The deal with my husband taking the job over the road was that we’d give it six months. If it wasn’t looking profitable by then, he would call it quits. He called it quits just short of six months, and we celebrated that September with Hotdog Medley Soup. It was a treat and a decent break from ramen noodles or white rice with canned chicken. Hotdog Medley Day became a family holiday that we still celebrate every year. We recap the story of the hard times (and the silly moments within them of course). Its a lesson of how good a small thing can be and how much love trumps comforts, pleasures, pain, and even necessity. Before poverty hit us, I was raising them on a combination of whole foods and popular, good ole American favorites on occasion. I bought fresh vegetables and fruits. I baked 2-3 times a week and hid veggies in delicious muffins. I did serve them meat and poultry since they had some dietary issues, but I prepared them in very healthy ways. I was proud of all my health-reading and proud that I put what I learned into action for my kids’ health. Then I had to suddenly convince them to eat canned vegetables, processed foods, and stale junk food. It was hard for them. But none of it seemed to matter when Dad announced that he was coming back home for good. For me, the lesson extended a bit more into ego. I desired to eat as a vegan and to live a vegan lifestyle. And when that ability was challenged through poverty, I felt ashamed for a long time. I placed a whole lot of guilt on myself for eating the hotdogs and the discolored burgers, etc. What was worse was that I was embarrassed to let others, even meat eaters, know that I was eating meat. I must have thought that I was elevated somehow as a vegan, which means that I naturally also judged the diets of others. And when faced with the choice to grow weak and leave my kids to fend for themselves or to eat the meat (and the products subtly containing animal like some gelatins and dressings, etc. ), I saw a little deeper into myself. All good must come straight from the heart. If it comes from there, its good. I knew when ideas sounded good. But I didn’t know my own heart nor my own reasons for what I did until some freedom and choice was taken away, shattering my ego. Set macaroni and grated cheese aside. Add all other ingredients to your pot. Heat thoroughly to blend flavors. Turn off heat and add macaroni. Sprinkle with grated cheese. 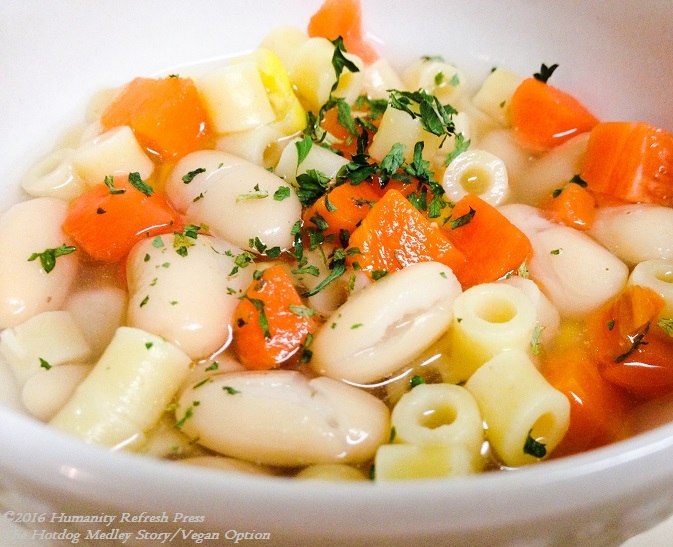 Substitute white or pink beans for hotdogs, and substitute veggie broth for chicken broth. Add a couple drops of olive oil to your soup, and follow the rest of the original recipe. Your honesty is so real and refreshing! Your story telling a gift. Thank you Kristina. So kind of you. I visited your site. Services sound genuine and wonderful.Namaste. Thanks for your honesty. I really related to your being uncomfortable about telling people you were no longer a vegan. I haven’t eaten meat for about 10 years now. When people ask me if I’m a vegetarian, I say, “just for today”. This gives me the freedom to have a piece of meat or chicken if I really I want one. So far that hasn’t happened, but tomorrow is another day. From your post, it sounds like some of your economic issues have lifted, And for that I’m glad. Your writing has a lot of power contained in it. Moshe you just warmed my heart. Yes, just for today is an excellent theme. I like that. Economic issues, not lifted so much, but lets say there’s an increase in gratitude. I enjoy your blog very much Moshe. Its a gift for us. Thank you.